The school year is drawing to a close, and as I look back on the semester, I can see many connections between Digital History and a course that I took last semester, Public History. 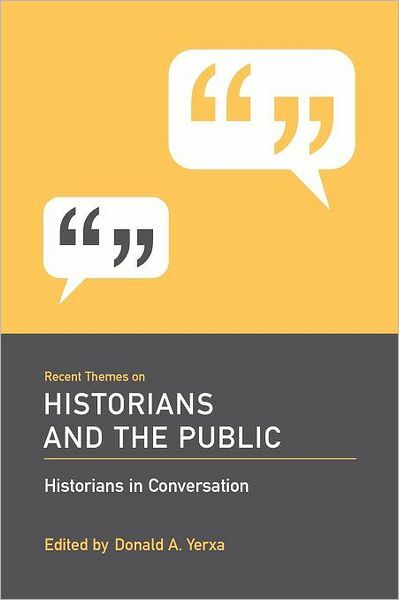 During my public history class, we read the book Recent Themes on Historians and the Public in our exploration of the theoretical issues that historians encounter when presenting history to the public. One debate in this book concerned the importance of finding a proper mix between narrative and analysis in one’s writing in order to hold the attention of a nonacademic audience while still examining the past in all its complexity. In Digital History, I was able to translate theory into practice. Edited by Donald Yerxa, this book describes some of the tensions between academic historians, historians who write for the public, and the public itself. Image retrieved from http://www.barnesandnoble.com/w/recent-themes-on-historians-and-the-public-donald-a-yerxa/1110987690?ean=9781570038341. The Internet is an incredibly vast network for historical discussion, but digital historians have to be careful about how they reach their audience; not everyone who reads their online work will have an appreciation for writing done in an academic style. For example, for our City Beautiful Omeka website, I had done a write-up that used the word “aforementioned,” and I didn’t even think about how for some people, especially those not in academia, that word might have a bit too much of a scholarly connotation. A fellow classmate pointed out that the simple word “above” would do nicely in its place in order to make the writing sample more accessible. On the other hand, if a public historian’s work is not academic enough, academic historians may complain that public historians (or in this case, digital historians) either water the past down too much or simply aren’t good historians. Although this may be true in some unfortunate cases, I would argue that an effective public historian is a historian first and foremost. For our City Beautiful projects, we went into the Dauphin County and Pennsylvania State Archives and conducted many hours of careful, meticulous research. We had to wade through vast amounts of information, decide which pieces were important, analyze them, and arrive at conclusions, just like any other historian would. It is only after this is done that public and digital historians can even begin to present their findings to the public. Digital History has been a wonderful opportunity because it has given every student not only the chance to be a historian, but to take it a step further and be a public historian.